Say congratulations to the graduate with this clever gift box with a top that looks like a mortarboard grad cap. The rest of the box is covered with coordinating scrapbook paper. Find this craft and 17 other graduation crafts in our FREE Graduation Craft eBook. 1. Cut two 4" x 12" strips of scrapbook paper. Use foam brush to apply white glue to back of paper strip. Aligning top and bottom edges of paper to box, attach paper to box side, smoothing flat with fingers to prevent bubbles under paper. Repeat with second strip of paper to completely cover outside of box. 2. From foam, cut two 1-1/4" x 18" strips, two 1" circles, one 8" square, and one 8-1/2" square. 3. Use lo-temp glue to attach one strip of foam around side of lid, with top and bottom edges aligned; trim remaining strip to fit and glue in place to completely cover side of lid. 4. Center 8" foam square on lid top; use lo-temp glue to attach foam. Center and glue 8 1/2" foam square over 8" square. 5. Use lo-temp glue to glue loop end (at fold with strands together) of tassel to lid center. Glue foam circles together and glue stacked circles over tassel loop. 6. 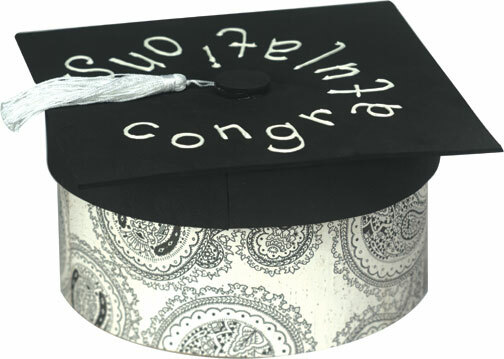 With White Foam Paint, paint the word "Congratulations" around top of cap shape; allow paint to dry thoroughly.